That’s the Way It is by Scoop: a demo made for Commodore Dossier Demo Competition in Netherlands in 1988. Code and Graphics by The Mercenary Cracker (Charles Deenen). Music by Deenen and Jeroen Tel. Commodore Dossier is a computer magazine, which was published from 1984 to 1988. Look at the bottom of the the article for seeing the full track list. Since he appeared in the Commodore 64 scene in the late 1980’s, the music of Jeroen Tel aka WAVE has played one of the strongest model of SID music after Rob Hubbard. Funky rapid bass, successional catchy melody using syncopation and call and response, groove with offbeat, fast rimshots, shuffle beat, and quasi-scratch sound using multi-speed – the high potentiality of SID music as dance music was confirmed by him. And that’s the reason why we still have referred to Jeroen Tel in chipmusic. This compilation traces the inheritance and variation of his musical style which was opened up by a music routine coded by Charles Deenen in 1987. I have run a similar trial/research before on the music of Geoff and Tim Follin . In 1988, the music made by him and his group Maniacs of Noise produced huge numbers of their followers and imitations by taking advantage of the appearance of the front-end tool Future Composer V1.0 appropriated Deenen’s music routine. But I selected notable songs pushed on Jeroen Tel style rather than such collective crafts here (without covers). We should feel the results came from an invention in chipmusic through these songs . See Follin Freaks (1988-2012) Part 1 and Part 2. One entrance to Jeroen Tel’s SID music is for example BitJam Podcast #152 – Jeroen Tel Special. The invention we regard as Jeroen Tel’s was neither achieved and spread by himself same as every artifact. From the naissance, this was closely-involved in the problem of property as it were. I think that it is something Tel and Deenen who belonged to cracker groups inevitably had to face when moving into the next phase. There is a monumental demo titled Noisy Pillars  for Maniacs of Noise founded by them as their basis for musical activities in 1987. This product released from Scoop, the parent group of Maniacs of Noise, in the same year aimed at the demonstration of his epoch-making music routine developed by Charles Deenen (the demo tunes were provided by Jeroen Tel). They tried to jump out from the scene had a principle of uncommercial use of productions back then. Jeroen Tel used hacked music routines by Rob Hubbard and Chris Hülsbeck, so their own music routine was required for the new purpose. Some messages of this demo are refractive as the motivation reflects: “Do not use our stuff without permission.” In other words, they properly realized that their stuff could be stolen and reused by somebody. The following text is: “Maniacs of Noise is a trademark of Scoop.” It is important that their new group was positioned as a trademark, not just a subgroup. The similar product called First Music Demo  is thought to be released after the demo, which was obviously produced for sending the persons connected to video game companies in United Kingdom and United States. The scroll text in the demo more notably tells their singular position of those days – they aspired for economic independence, having their origin in the demoscene. The music routine used in Noisy Pillars was reused as expected in Future Composer V1.0 coded by FCS of Finnish Gold in 1988 . According to Lemming, younger brother of FCS, Charles Deenen and Jeroen Tel realized this fact and sent letters to prohibit them from releasing the next version of Future Composer. But nonetheless the tool was successively updated by other groups without avail and rapidly spread in the demoscene. 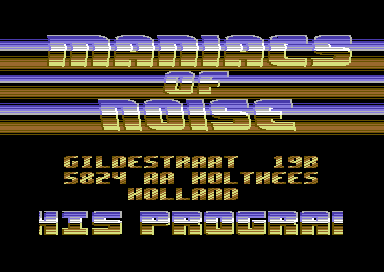 And in the end, it instantly became a de-facto standard for making SID music in the C64 scene after Soundmonitor. Future Composer didn’t only use the music routine of Noisy Pillars, but also had the limitation of changing the instruments. Therefore it meant that songs produced with this tool could sound like the music of Maniacs of Noise in a period of their history to some extent unless someone modified it. On the other hand, Deenen repeated improvement of his own music routines. It seems that Jeroen Tel currently has a different attitude to these hacking activities of the demoscene. In 2004, he appeared at X, annual C64 demo party in Netherlands , with new SID tune after 10 years. He has attended many other parties since then. He also provided lots of source codes used in video games he worked for ROMHacking.net in 2011 . Additionally, when Swedish Dees Productions (Xiny 6581) submitted the video of disassembling his representative song Cybernoid on YouTube, Tel was the first to comment on it . These cases adequately show how he has still kept up the connection with the demoscene. The musical style of Jeroen Tel has survived even after the period that their music routines were hacked passed by. There are some musicians who inherit it lushly. Their music is not indistinguishable like typical imitations produced in the 80s, but distinctive on their own. In short, the music of Jeroen Tel produced a classic example of chipmusic, and later left something more than it. I tried to save the “something” here as much as possible. We might be able to touch a part of chipmusic as continuous formation in history through this compilation. And this formation is not over yet. Thanks for the comments and info, Xenox. Your podcast series are always very enjoyable and informative to me. Especially, my favorite is FN-Anthology (Multispeedlikeedit).